When Jay and Susie Gogue moved to Auburn in 2007, “Gogue” was barely a household word, and neither likely would have been stopped in the aisles of a local grocery store. 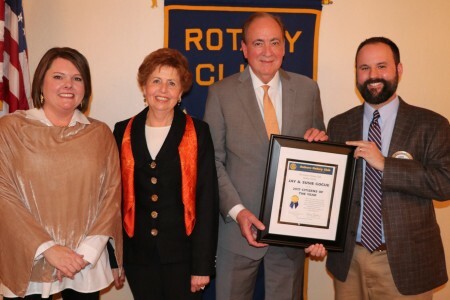 Ten years later — at its Wednesday, Jan. 10 meeting — the Auburn Rotary Club celebrated the Gogues’ decade-long legacy of bettering Auburn University and the city it calls home by naming the couple as its co-citizens of the year. The Auburn Rotary Club has honored an individual, individuals, businesses and nonprofit organizations as its citizens of the year since 1983. The award is bestowed to those who exemplify Rotary International’s local or global service focus. Elected or public officials nominated for the award must have community contributions beyond their immediate public service duties. In presenting the award on the behalf of the club, Citizen of the Year Committee Chair Martee Moseley said “Team Gogue” was a well-deserved moniker often used by locals referring to the couple’s community impact. “It was very clear that in all they have done professionally and civically, they have operated as a team,” she said. To mark the honor, the Gogues received a framed certificate noting that their civic contributions have bettered the Auburn community and modeled Rotary International’s tradition of “service above self.” In addition, the Auburn Rotary Club made a $1,000 contribution to a charity of the Gogues’ choice, which was the Food Bank of East Alabama. After leadership appointments at Clemson University, Utah State University, New Mexico State University and the University of Houston System, the Gogues — who both graduated from Auburn in 1969 and will celebrate their 50th anniversary this year — moved to Auburn in July 2007 upon Dr. Gogue’s appointment as Auburn University’s 18th president. His 10-year tenure as president was marked by increases in student enrollment, the research enterprise and outreach partnerships. The Gogues’ dedication to supporting the community outside Dr. Gogue’s day-to-day duties as president equally endeared the couple to the community and created an enduring legacy for the university and the community alike. Their shared vision for a world-class performing arts center that would benefit both the university and city led to the naming of the Jay and Susie Gogue Performing Arts Center in their honor. Construction of the performing arts center is expected to be completed by August 2019. Previous Citizen of the Year award recipients present for the ceremony included Auburn Bank, represented by President and CEO Bob Dumas (1983); retired physician Dr. Jim Mathews (2002); Dr. J. Terry Jenkins, retired Auburn City Schools superintendent (2007); Jule Collins Smith Museum of Fine Arts, represented by Museum Director Dr. Marilyn Laufer (2011); Auburn Mayor Bill Ham (2012); K. Ted Wilson, retired financial adviser and founder of Wilson Investment Group (2014); Dr. Mary Burkhart, retired director of the Osher Lifelong Learning Institute at Auburn University (2015); and Auburn Chamber of Commerce President Lolly Steiner (2016). The Auburn Rotary Club is one of 33,000 Rotary International clubs in more than 200 countries and geographic areas. The worldwide Rotary International network includes more than 1.2 million neighbors, friends, community leaders and problem-solvers who, for more than 110 years, have come together to make positive, lasting change in communities at home and abroad. The Auburn Rotary Club meets weekly on Wednesdays from noon to 1 p.m. at Saugahatchee Country Club. For more information about the Auburn Rotary Club or how to become a member, visit www.auburnrotaryclub.com.